Six months ago, many in the consumer electronics industry had written off large-screen OLED TVs as being dead before arrival. Quality-control issues were preventing manufacturers like LG and Samsung from bringing their long-promised 55-inch OLEDs to market. Instead, these companies had shifted their priorities to Ultra HD. Back at CES, LG assigned a $12,000 price tag and March release date to its 55-inch OLED TV. When the ides of March had come and gone (along with the rest of the month) and no TV arrived, that seemed to be the final nail in the coffin, at least in terms of public perception. • Read more original content like this in our Feature News Stories section. Then, LG and Samsung surprised everyone in late July and early August when they actually introduced OLED TVs to the U.S. market. These weren't just "coming soon" announcements like the ones we had heard so many times before. They were real OLED TVs that you could actually buy, but they weren't the exact models shown at earlier shows. Instead, we got a pair of curved 55-inch OLED TVs. LG was first to the plate with the 55EA9800, which originally carried an MSRP of $14,999. Samsung followed shortly thereafter with the KN55S9C and shocked us all with a price point of $8,999.99. At first, LG asserted that Samsung's lower price point would not influence their own, but the 55EA9800 now has a listed MSRP of $9,999.99. Yes, we're talking $10,000 for a 55-inch 1080p TV. That's a premium far above almost any other similarly-sized plasma or LCD TV currently on the market, including the new Ultra HD models. What does OLED bring to the table that makes it worth the big step up in price? In three words, contrast, contrast, contrast. We've discussed how OLED display technology works and covered its potential advantages in previous stories. In a nutshell, because OLED is a self-emitting technology in which each pixel generates its own light, it is capable of offering up absolute blacks in tandem with very bright elements, which results in image contrast that surpasses anything plasma and LCD can muster. Plasma pixels are also self-emitting, but the pixels have to be primed, which results in some light being emitted - it's a very small amount of light in the case of Panasonic's latest ZT and VT models - but it's still not the absolute black you can get with OLED, which is also capable of more light output than plasma. LCDs can be very bright, but also require a light source that hinders black-level performance. Local-dimming-enabled LED lighting systems can improve an LCD's black level immensely by allowing the TV to turn off the LEDs in black areas of the image; however, this effect is not as precise as what you can get with plasma or OLED, and it's even less precise in the hugely popular edge-lit LED designs compared with a full-array LED backlight system. In the interest of full disclosure, I should also list a couple potential drawbacks of OLED: as with plasma, there is the potential for image retention, and there's also concern about uneven wearing of the pixels (namely, blue). We don't yet know how these will play out in the real world. Another plus is that OLED allows for an unbelievably thin and flexible form factor, hence the curved nature of the new TVs. We see curved projection screens in larger professional (think IMAX) and home theaters to create a more immersive experience, but will it really make a difference on a 55-inch screen? Not likely. 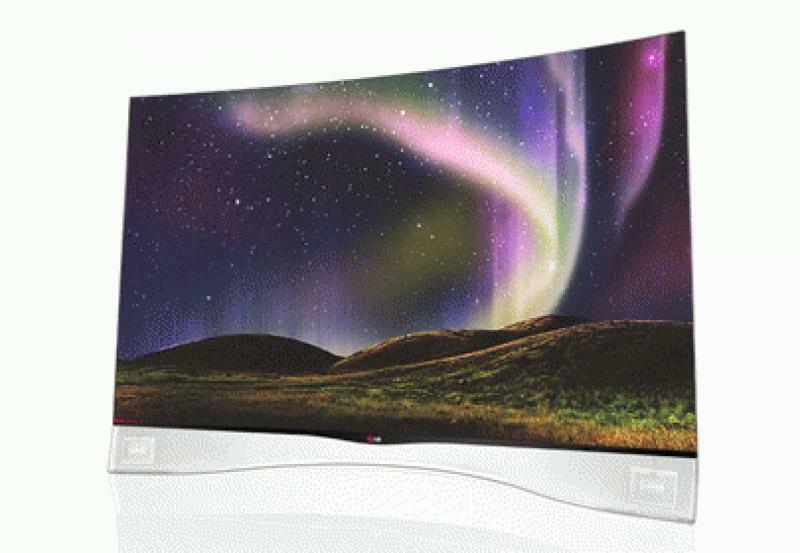 LG and Samsung like to suggest otherwise, using phrases such as "IMAX-like" and "draw viewers into the picture," but at the end of the day, the real benefit of the curved screen is that it visually distinguishes these new OLED TVs from everything else on the market and makes people say, "Cool!" Some of our Facebook fans questioned how anyone could spend that kind of money on a 55-inch TV that doesn't have an Ultra HD resolution. I've already gone on the record as saying that I don't think an Ultra HD resolution is important at the 55-inch screen size. Yes, there are some 55-inch UHD TVs on the market (currently priced around $3,500 to $4,500), and we've reviewed one of them: the Sony XBR-55X900A. Even with native UHD content (what little I had), I could not see a dramatic difference in detail between the Sony and a couple of good 1080p models at a common seating distance of 10 feet. Even at about six feet, it required very close examination to see the improved detail. If we were talking about an OLED TV with a larger screen size of 70 inches plus, then yes, I think Ultra HD would be a more important inclusion. Obviously, the target demographic for a $10,000 55-inch TV is not very large, consisting of well-to-do early adopters who want to be able to show off the absolute best picture quality in the absolute coolest form factor. For most of us, the performance of a plasma like the Panasonic ZT60 or the even more desirably-priced VT60 will keep us happy for some years to come. If you do have the means to invest in one of these early OLED TVs, do you have to worry about your new, expensive TV being completely outdated in the next couple of years? I don't think so. I do believe we'll see more Ultra HD playback devices start to arrive next year, but I in no way think means the imminent demise of our current HD formats. I mean, come on: broadcasters haven't even embraced 1080p yet. Most of them are still compressing the crap out of 720p and 1080i, so widespread Ultra HD broadcasts here in the U.S. aren't anticipated in the foreseeable future. Likewise for popular streaming services like Netflix and Amazon that are still trying to get the best quality out of 1080p content transmitted over our current broadband systems. Yes, specialty Ultra HD products and services will emerge, like Sony's new FMP-X1 4K player and 4K streaming service (currently only compatible with Sony 4K TVs) and the RedRay player. However, they will be a small piece of the pie. OLED's superior contrast can provide an immediate benefit in picture quality with the sources you own right now and, dare I say, even with an Ultra HD source in the near future. Back when I worked at another home-theater-oriented publication, we did a shootout of multiple TVs, in which a 720p Pioneer KURO easily won out over 1080p plasmas and LCDs with native 1080p content ... and actually looked more detailed. Why? Its black level and contrast were significantly better. A 1080p OLED could very well produce an image that seems more detailed than that of an edge-lit LCD with a UHD resolution. Granted, it's not an apples-to-apples comparison because the move up in resolution from 1080p to UHD is larger than the one from 720p to 1080p, but again, I don't think that jump is significantly visible at the screen size we're talking about. And hey, if you simply don't believe me and your heart is set on Ultra HD, then just wait a little longer. Panasonic and Sony both showed 56-inch 4K OLED prototypes back at CES 2013 last January. No release dates or prices were offered. However, now that LG and Samsung have created a real-world large-screen OLED TV category, we can be more optimistic that other OLED TVs aren't just vaporware and will see the light of day.